The Origin Instruments Corporation Sip & Puff Switch is a head mounted accessory used to actuate a two position switch by a simple sip or puff. It consists of a head frame with attached mouth tube and a switch box connected to the head frame by a second plastic tube. Sips and puffs are converted to switch closures inside the Switch Box. These switch events are made available on two connectors labeled "Sip" and "Puff." 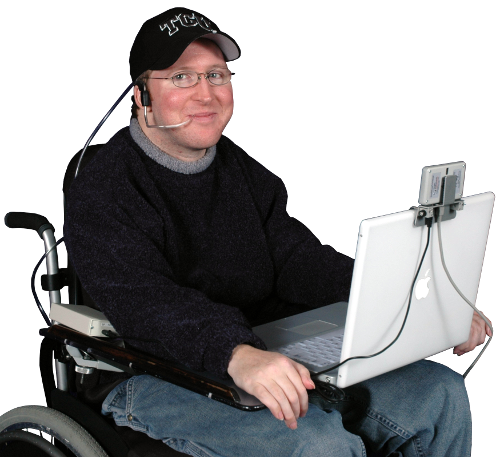 The Sip/Puff Switch is ideal for accessing electronic devices such as the Headmouse® Extreme or other mouse emulators, augmentative communication devices, and devices accessed or controlled by scanning. Comfortably holding the supple mouth tube is a padded head frame that slips over the ears and behind the neck. The replaceable mouth tube is held next to the mouth with and integral stainless steel forming wire. In addition to bending the plastic mouth tube and wire they can be cut to facilitate individual users. A second pliable tube runs from the head frame to the switch box where it attaches with a simple twist connector. The metal switch box contains the pneumatic devices that convert sips and puffs to electrical switch closures. These switch events are accessed from the 1/8" (3.5mm) microphone connectors on the end panel. The switches are designed for low current electronic loads. The Switch Box, padded Head Frame with attached Mouth Tube, additional Mouth Tubes, interconnecting tube between Head Frame and Switch Box, and two 1/8" (3.5 mm) microphone cables.